With more than 77% of the world’s search traffic handled by Google, high visibility on that search engine is critical. There’s more to visibilty than just a first-page listing on Google, however. One of the most effective ways to increase your visibility in Google is with a Knowledge Panel. Knowledge Panels are eye-catching features that summarize the information people are most likely searching for. They are available for corporate brands, local businesses, celebrities, authors, books, movies, and more. 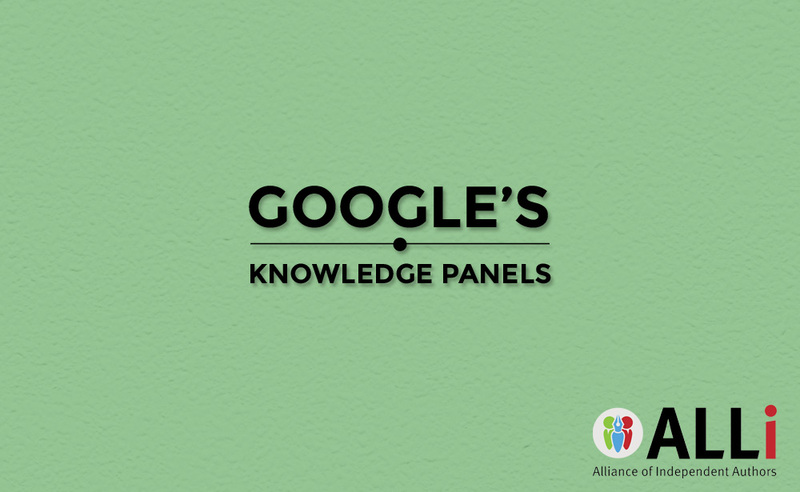 Knowledge Panels are assigned by Google, so it can be hit or miss as to whether you’ll secure a listing and what data appears there. But although it can be cumbersome to set up, the Knowledge Panel’s prominence on a search page and its cachet of authority make it well worth striving for. The Knowledge Panel occupies the space to the right of the search results. Shown here is the Knowledge Panel for ALLi founder Orna Ross. A Knowledge Panel will not increase your search ranking. If your site appears on page 20 of the search results for a given term, having a Knowledge Panel will not boost it to the first page. What it can do is increase click-throughs to your site. The feature appears in a prominent box to the right of search results (or at the top of the screen on a mobile device) which takes up a substantial part of the screen’s real estate. It’s hard to overlook Knowledge Panels: they are huge. Knowledge Panels comes in several formats, the contents of which vary depending on the subject and the source of the data. (We’ll look at data sources in a moment.) For an author, a typical Panel may include photos of the author, an excerpt from a biography, a list of books and their publication dates, images taken from the author’s website, award nominations, social media profiles, or a link to their Wikipedia entry. Knowledge Panels also allow you to post small status updates which can be used to promote sales, new releases, or to direct visitors to your website or mailing list. Google assembles the information in a Knowledge Panel from several possible sources, each of which may presents challenges. The more of these sources you have referencing you, the better your chances of having rich content displayed alongside Google searches, but a single entry may be sufficient to generate a Knowledge Panel. Let’s look at each in turn. Both Wikipedia and Wikidata are crowdsourced references. Wikipedia is encyclopedic, whereas Wikidata is a hierarchical database. Both are open for anyone to edit, but there are rules, procedures, and customs that users should acquaint themselves with before diving in. Wikipedia tends to be the more strict of the two, with strong prohibitions against editing your own entries or entries for which you have a perceived conflict of interest. There are additional requirements such as notability, which dictates that the subject of an entry be “sufficiently notable” to warrant inclusion. That generally means multiple references to the subject in mainstream media, professional critiques and reviews, significant awards, or news articles, and these references must be sourced to reputable, verifiable sources. Although enforcement of the rules can be erratic, editors who inadvertently violate the sometimes Byzantine rules and politics of Wikipedia may find their work summarily deleted. Google+ offers a special type of account called a brand account, which has similarities to a Facebook Page. Brand accounts can have multiple administrators, and allow you to interact with Google products like Google+ and YouTube under the identity of a business or organization. Google may use information from brand accounts to populate Knowledge Panels, so authors and service providers can benefit from having their brand account profiles filled out completely. Structured Data Markup is code you add to your website that makes it easier for search engines to identify and categorize your content. You can generate this code by hand or through various tools, such as Google’s Structured Data Markup Helper or the JSON-LD Generator from Hall Analysis. 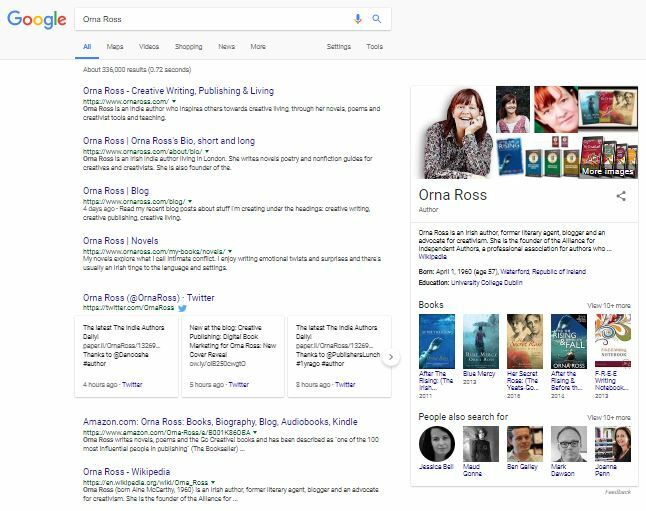 Adding this to your biography or About page on your website gives search engines clues about the content of the page, which they will try to use in a Knowledge Panel. Having this information on the page doesn’t guarantee that you’ll be assigned a panel, but it increases the odds. Note the “sameAs” attributes. These values are a list of social media profiles which Google may incorporate into your panel. Currently, Google recognizes only links to Facebook, Twitter, Google+, YouTube, Instagram, LinkedIn, and (heaven knows why) Myspace. With either approach, you can add code that identifies your website, your author persona, your social media profiles, a blog article, a book review, products for sale, etc. Unfortunately, Google does not yet publicly support the Book schema; that option has been in closed beta since 2016 and is currently available only to high-volume retailers. Other search engines may recognize and use the data, so adding this markup to your website isn’t a waste of time. And when Google eventually opens this feature up to the public, you’ll have a headstart on the competition. There are two types of Knowledge Panel: the brand panel we’ve seen above, and the local business panel, which is region-specific. The local business panel is intended for companies with a physical location, and so it emphasizes location and hours of operation. To see the difference, search for Waterstones in Google. The Knowledge Panel display features information about the company, its founders, its social media profiles, and other general information. That’s a brand listing. When you search for Waterstones at Trafalgar Square, the Knowledge Panel features reviews, store hours, maps, and photos specific to that one location. That’s a local business listing. In most cases, local business listings will only be visible to searchers in the vicinity of the business’s address, or who specify a location in their search. This makes local business listings less useful to authors and publishers than a brand listing, but they gather information in the same way brand panels do, and so they may be a good first step while you’re growing your brand’s visiblity. A physical location is required for a Google My Business listing, and this address is displayed on the Knowledge Panel. Online businesses do not qualify for a local business panel, and the address cannot be a post office box or similar mail drop. Once you submit an application to Google My Business, they will mail you a postcard to confirm your address. When you receive it, you’ll enter the confirmation code on the card, and your listing will become public almost instantly, including a link to your website and any photos you provide. Understandably, home businesses may be reluctant to publish their address, directions to their home, and satellite or street-level pictures of their property. All of that information is included in a local business Knowledge Panel by default, but there’s a loophole that allows that sensitive information to be suppressed. A business that self-identifies as a “service business” will not have its address displayed. It’s an option intended for warehouses and other locations that are not open to the public. Instead of a street address, the Knowledge Panel displays a map of the area the company serves. This service area also determines who will see the panel, and that’s where the power of this feature becomes clear. A company that serves Walla Walla, Washington will have a Knowledge Panel visible only to search users in that vicinity. But a company can designate entire nations in its service area, which means a business could list its service area as the United States, Mexico, and Canada, and its Knowledge Panel would then be visible to anyone searching in North America. There does not appear to be a limit to the number of regions a business can list in its service area. There’s a great deal of latitude in the definition of these service areas. Nevertheless, if Google determines that a business’s service area is inaccurate, it may revoke the listing and associated Knowledge Panel. Sign up for a Google+ account, and make it a brand account. Fill out the profile thoroughly, especially your websites, social media links, and pictures of you and your book covers. Sign up for a Google Webmasters account, add your website to the Search Console, and verify your ownership so Google knows the site represents you authoritatively. Link back to your website whenever it’s appropriate: in signatures, in a bio on a guest post, in commenting profiles. Fill out the ALT tags and descriptions for your images so this information may be picked up and listed in your Knowledge Panel. Add Structured Data Markup to your website to identify yourself, books, and reviews to search engines. Google excels at collating data about a subject, but the algorithms are not infallible. If your Knowledge Panel includes content that’s not yours, or you would like to suggest an image to use as the main image, click the tiny Feedback link at the bottom of the panel and submit a correction. Do you have a Knowledge Panel? Are you trying to get one? Let us know in the comments below! I am facing difficulties in creating knowledge graph, help me out. I have a social network and I am trying to achieve knowledge panel for each of my signup users. “John Patrick” a user of my site. I should be able to generate knowledge panel of that users information. As that users only exist in my site he does not have any Wikipedia account, wiki data account or Google+ account. I have only control over on meta data and page sceema. I hope I was able to explain myself here. I am curious, you mentioned re brand panel and I would like to get listed for this in all regional search engines. …… But a company can designate entire nations in its service area, which means a business could list its service area as the United States, Mexico, and Canada, and its Knowledge Panel would then be visible to anyone searching in North America. There does not appear to be a limit to the number of regions a business can list in its service area….. So I have a brand with a physical address in Monteral but I also want it to show for international searches as well. So it is showing the knowledge panel for .ca engines, but not showing for .com or .co.uk etc. What must I do to ensure it shows? I would love to get one. I have updated my Google+ and Google Brand accounts, but I can’t find a place for the website and social media like you mention. My site is in the Google webmasters account, so hopefully I will someday get a knowledge panel. For Wikipedia, is there a way to get a page without paying someone to write one? Thanks, John, very useful. I’m now the proud of the brand of myself … but tell me, where do I go to get the covers of my books uploaded? I can’t see anything on the Profile page that would allow that. Unfortunately, there’s little we can do to control that, as it’s up to Google to find and index that information. To maximize the changes of that happening, name images of your books appropriately and apply descriptive alt text when you use them on your blog or author website. Including images of your books in your Google+ profile will help as well. If you went with the Google My Business option, you can upload images to your profile manually. Once Google supports structured data markup for the Book type, this should become much less random.